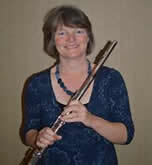 Gillian is a qualified class music teacher – she taught in first and middle schools. She teaches flute, piano and recorder (especially to beginners and young children) and also enjoys teaching in middle school too. She enjoys playing her flute in the DMS orchestra and flute ensembles and also keyboard and/or flute in her church music group. She plays for school Taize services and is married, with four children ranging from 9 – 17!